They have started today to tear down the scaffolding. In a sense, it feels very strange to have this enormous task almost over. What shall we get angry about? Will Isabella stop to talk about roofing felt, tiles and chimneys? I am actually quite sure that we will use our time for doing other things, but also to prepare ourselves for the final leap on the roof, this spring. We have three things, roof wise, that we want to complete (before we turn 80). Add the "crown" to the chimney (skorstenskrona) as it is in our postcards. We had too many questions right now and we felt that the plater was not having the time for our crazyness. Ridge tiles masonry with lime mortar (murning av nockpannor med kalkbruk). 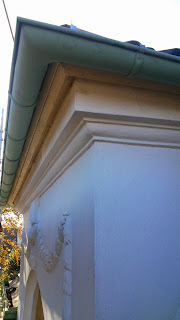 This is how usually the ridge tiles are fixated, according to tradition. Painting the metal sheet. Yes. Why are we planning to paint the metal sheet? Simply because we have chosen a metal sheet (the painted metal sheet, lackerad plåt) which looks too "plastic" on our kind of roof. 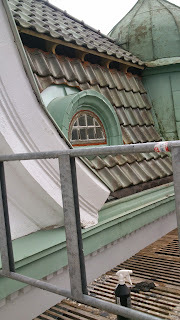 There are a lot of discussions, especially from a cultural architectural perspective, that one should follow the tradition and install on old roofs only, the so called, galvanized sheet metal. However, from 2006 this kind of sheet metal has a difference which makes it not so reliable for the painting: the protection layer has been changed to be more environmental friendly. 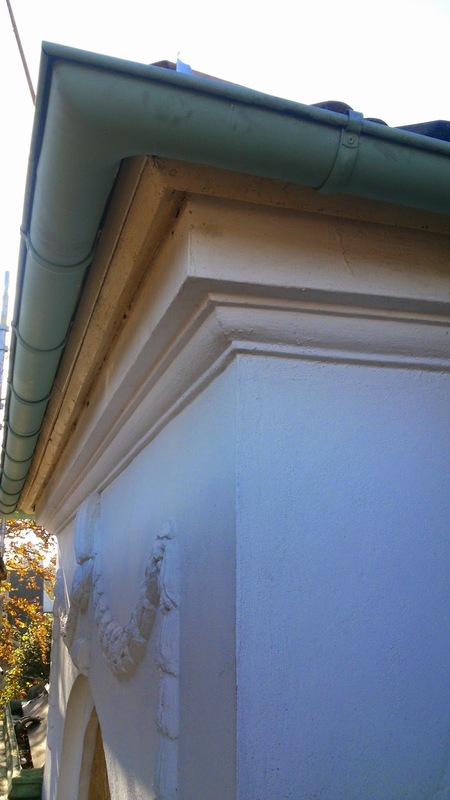 If before it was enough to wait a couple of years before painting, now it seems that this layer is more resistent and the metal sheet is so perfect, anyway, that the paint doesn't seem to get a good grip on it. Due to these reasons, on the market, a galvanized metal sheet with a prepainted layer has appeared (kulturplåt), but it is not very commonly used and the long term resistance of the material is uncertain. Although there have been uncertainties, also in the past, on painted metal sheet, we decided to go for that, with the thought that, since we wanted to be at least closed to traditional methodologies, we would have ended up painting it all. And that is what we will have to do this spring. Some minor adjustments are still necessary on the front southern roof. Detail over one of the new dormer windows and the "separator"
The half moon dormer window that was necessary to redo. The window is not yet done, but the window frame has got back its color (or almost).